Rakesh Jhunjhunwala of Rare enterprise is rare personality. Rakesh Jhunjhunwala according to me is true champion of Indian stock market. Rakesh Jhunjhunwala is real inspiration for stock market investors. 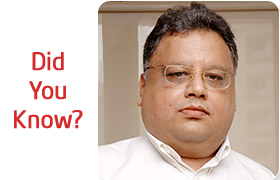 Today I will share 12 unusual stunning facts of Big bull Rakesh Jhunjhunwala. By Stock market investment Rakesh Jhunjhunwala has made Rs 5000 Cr from 5000 Rs/- in 30 years. Imagine making 5000 Cr in 30 year. According to Forbs magazine Rakesh Jhunjhunwala is considered as 46th richest person in India for 2013 with net worth of $1.25 billon. Rakesh Jhunjhunwala is many time referred as warren buffet of India and he is known to be a big fan of Bollywood. He has produced one hit movie called English Vinghlish. He has taken pledge to carryout charity and he will donate 25 per cent his wealth in his lifetime. Rakesh Jhunjhunwala enjoys few lakhs of rupee as dividend and he spend one third of his dividend income in charity. Rakesh Jhujhunwala networth was Rs 3461 Cr in 2007 and value of his holding has plunged to Rs 1130 Cr in 2008 down turn. Although his wealth was plunged by one third he remain invested in stock market. In past one year he has made daily gain of Rs 8.4 Cr in stock market. This gain is equals to million dollars a day. Net worth of Rakesh Jhunjhunwala was nearly growing by Rs 60 Cr a week and 240 Cr month. If we break down further he made hourly around Rs 35 lakh in stock market. This money is enough in buying Audi or BMW car every hour. According to latest report combined net worth of Rakesh Jhunjhunwala and his family is Rs 7261 Cr compare to Rs 4192 Cr last year. In last one year net worth of rakesh jhunjhunwala jumped by 73%. Rakesh Jhunjhunwala current net worth is beating market cap of 96% of listed companies. Titan, Lupin, CRISIL are hot favorite stock of Rakesh Jhunjhunwala His family holds equity share of over Rs 100 Cr in each of these companies.Apart from equity he also hold properties in Mumbai worth more that Rs 100 Cr. Rakesh jhunjhunwala is foodie in nature, he love to watch food shows. He love Chinese food & dosa on street. As per report he is found of Horse and he own number of horses. If you find above facts interesting do share with your friends on facebook and Twitter. This is really an inspiring story of the stock market investor. I really liked the fact that he has made great wealth within few years.